UPGRADED DECAL SET NOW WITH MORE OPTIONS! U.S.S. Enterprise REFIT Hull markings and details decal set for the AMT 537 (also referred to as 600 scale) U.S.S. Enterprise Refit model! These fit the original 1979/80 smoothie release as well as all later versions with the scribed in paneling patterns. 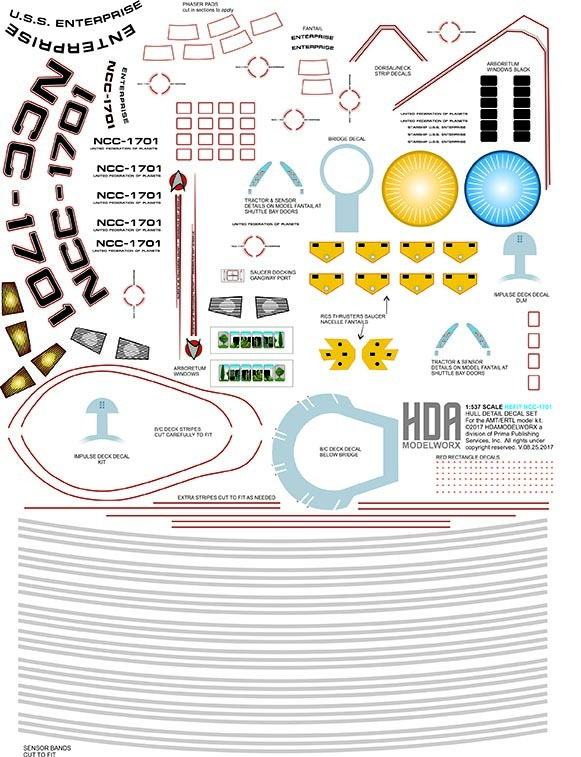 These decals provide sensor bands for the saucer, windows for the arboretum in black and simulated interior, RCS thrusters, name and registry, docking ports, gangway docking port, impulse deck detail, red rectangles for various areas of the ship, red rounded squares for saucer ports, two options for the deflector dish, dorsal stripe detail, B/C Deck stripes, top B/C Deck decal for below bridge, Phase Pad decals, Extra red stripes, and more! This is the NCC-1701 Version of the Decals. A separate NCC-1701-A decal set is now available.